Does he know the Lord? So what’s his life about? It seems misrepresentative to call this prize-winning début a “collection”. The word implies that each item within has distinctive merit to be effective in its own right. In the case of Apichella’s work, it is more of a poetic novella, where each verse is a numbered chapter; each poem informs the next, and as a result, the first excepting, no poem really stands alone without the support of its peers. Each is a pillar holding up a continuous narrative bridge, such that the whole only works effectively if traversed from one end to the other. this. I need no one. As the title implies, religion not only forms the backbone of the plot, but also dictates (to an extent) the poetic structure. It is no coincidence that “David” the protagonist harks back to the biblical King David, writer and curator of much of the Book of Psalms – a perfect irony, owing to his namesake’s atheistic status – and comparisons with the verbal music of the Psalms are too clear to extrapolate. Most chapters are a couple of dozen lines or so – a few stretch over two pages or more; one, “13”, reads merely “I’m thirsty as earth in high summer.” Apichella is inventive in her use of spacing, tabbing, italics, and even the spacing of individual l e t t e r s for various emphases, sometimes using these techniques in combination. “76” stands out blatantly in this regard, in the odd position of being printed sideways, landscape-style, across its page. eyes, thoughts to us them. make a cord less easy to fray? Yet David won’t be looped. rings at the sound of your laugh. 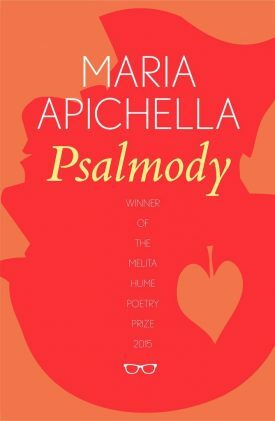 In short, Psalmody tells an absorbing story within a boldly musical framework of religious inquisition. Wholly recommended.